Unique & romantic holiday cottage in Oneroa Village - complete with spa pool! Winner of Bookabach Supreme Bach of the Year and Best Quirky Bach 2016! Superbly located on Church Bay Road, The Treehouse is a fabulously unique property, in a magical setting. 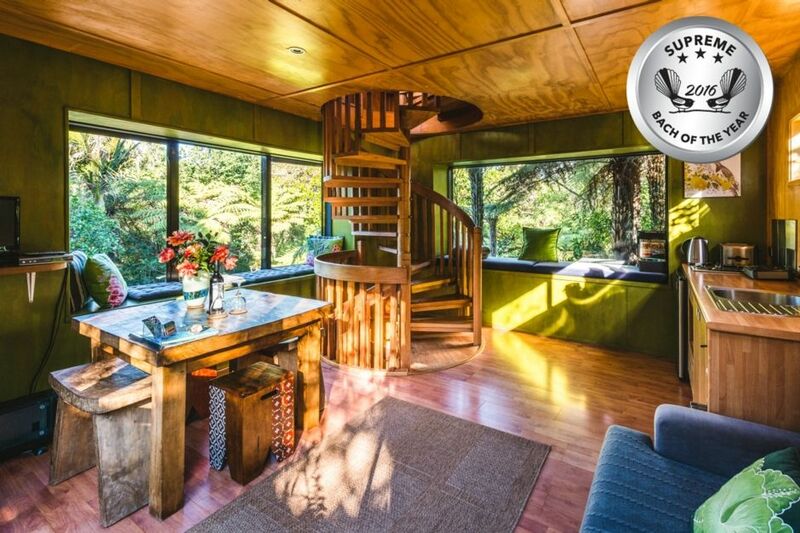 Hidden down the bottom of the beautifully landscaped garden, The Treehouse is set over 3 levels, connected by a lovely spiral wooden staircase. You enter on the living level, which has an open plan living, dining and kitchette, well equipped with everything you need for your holiday. The master bedroom is upstairs, has a superbly comfortable queen sized bed, and catches wonderful morning sun - perfect for a lovely sleepin! The third level of the house is downstairs from the living room, and contains the bathroom and a snug second bedroom. This opens out onto the large deck set over several levels, surrounded by native bush, overlooking a fish pond - this is the perfect spot to relax with a good book and a glass of wine. Then have a soak in the hot tub, enjoying this tranquil scene, which is lit up at night - very romantic! The Treehouse is Waiheke's best little Romantic Retreat, the perfect place to get away from it all and recharge your batteries and a superb base from which to enjoy all the wonders of the Island. We'd love to have you to stay and we will do all we can to make your holiday truly memorable. At the top of the garden is another property, The Parrot's Nest, which is also available for rental, talk to us if you have a larger group and would like to rent both properties together. All bookings incur a one time linen and exit cleaning cost of $80 so you have nothing to do but relax, unwind and enjoy. Be My Guest are a locally owned & operated property management company. We pride ourselves on ensuring that our properties are well maintained & ready & welcoming for your arrival. Our team are on call throughout your stay. The Treehouse is a fabulously unique property, in a magical setting. A fabulous 3 story board and batten house hidden down the bottom of the beautifully landscaped garden. Winner of Bookabach Supreme Bach of the Year & Best Quirky Bach 2016! Unbeatable central location walk to the village then escape back to your private native bush garden! Very romantic! Wow! We absolutely loved our stay at the Treehouse. The name is very suiting. Surrounded by trees and ferns with a view of a little pond. It had everything we needed for a great stay. The hot tub on a rainy day was perfect. We would definitely stay again. Amazing property full of character. Close to the ferry and Oneroa village. Hidden away yet just a stroll to the cafes and beach. Lovely, private and romantic place to stay! Beautiful spot. Loved the romantic atmosphere, the secluded garden with spa and the handy location. We had a great stay, the treehouse is a quirky bach, with a lovely outlook to the tree tops. Very clean and tidy. We were there in winter, & the spa was a welcome way to warm up after visiting the nearby (& recommended) mudbrick winery. Excellent location so close to Oneroa. Great for a romantic weekend away. I would love to return in summer to get some use of the large deck. Located in a very friendly residential neighbourhood, close to Oneroa Village, but walking distance to farmland & wineries. Cable Bay and Mudbrick wineries are further along the road and make for a very pleasant afternoon of wine tasting! Further afield, Waiheke has a lot of wineries & fabulous beaches.